We like the FORD LOGO, Good chairs,fold up easy and slide back into their storage bag. Great for car shows! Fine for car shows. The only drawback is the cup holders are too small for anything but small soda cans. Nice item, standard folding chair. Ford logo and stripes look good. 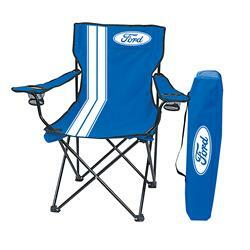 Ford racing blue folding chairs! Very nice fabric and sturdy. Chair is very nice I just wish they were made a little larger for comfort.